When Is the Best Time to Launch a Crowdfunding Project? What creators should keep in mind when creating their project timeline? 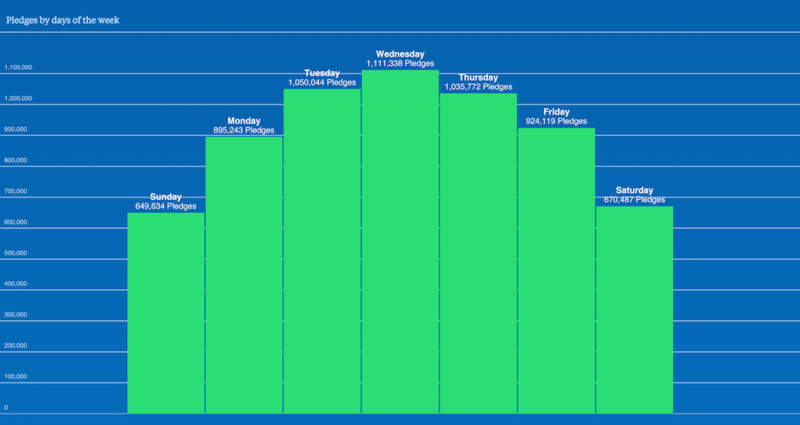 How important is the time of day or day of the week a crowdfunding begins and ends? So, you have an idea or project that you would like to raise funds for with a crowdfunding campaign? When is the best time in the process to press the launch button? Getting right with timing will make your crowdfunding efforts easier and increase the overall success of your campaign. That said, an optimal timing strategy requires foresight, so always start by allocating enough commitment and resources for proper planning. 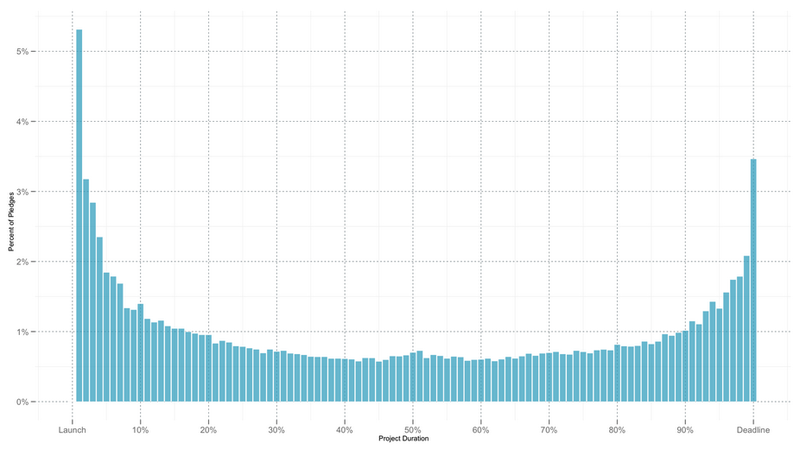 After working with thousands of projects at different stages, we’ve found that launch times really depend on the nature of the project. For example, if you are into product design, then it’s imperative that you have the supply and manufacturing chain ready to go before going live. Otherwise, you may succeed at raising the needed funds but fail to deliver the product after the campaign has ended. Project creators must plan for success, both in raising the solicited funds and delivering the rewards in time. We always recommend creators to invest heavily in planning, as they can’t go wrong by doing so. If you ever need any assistance setting up your project, the team at Backercamp is always happy to lend you a hand. Far from being a relaxed and idle month, August seems to be the most active month of the year in terms of successfully funded projects. Weekdays work much better than weekends. Wednesday is the most the popular day for pledges. Usually creators launch on a Tuesday and end on a Thursday. It may seem like the more days, the more moneyprojects raise, but in reality the contrary is true. Why? With crowdfunding, there are many factors involved (social community dynamics, project planning, marketing strategies, creator phychology, et.) that may be complex to control all at the same time while campaigning. 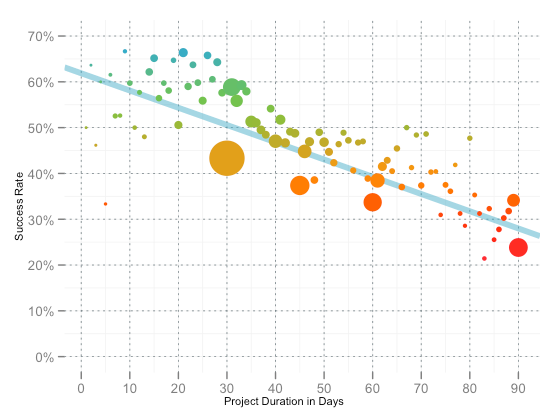 Our experience and data tells us that adding more days to your project’s campaign will not bring in more funding, it may actually decrease your chances for success. Experienced, serial project creators always set a short time frame for their projects. Shorter time frames give their projects a better chance of reaching its goal, let’s analyze the secrets behind campaign duration. Increase the sense of urgency among visitors. Force your team and backers to concentrate your efforts on promoting the project right away, and not procrastinate. Keep up the momentum mid-campaign (the project trough), as the beginning and the end (the most active periods) are closer. Reduce accumulated stress. Campaigning for long periods of time may end in a burnout syndrome, and that will wear on your team’s performance in promoting the project. Adding more days to the length of your project’s campaign will not bring in more funding, it may actually decrease your chances for success. Avoid losing any important days due to a long weekend or a holiday. Make sure that your team is available during the last days of the campaign, as the final push will need additional promotion efforts. Constantly review data & statistics. We suggest checking out the Kickstarter stats page and their annual reports. Launch only after your project is fully built and has been reviewed by several people (friends, family and complete strangers). If your product or idea is seasonal, then be sure to launch in the appropriate season. The optimal campaign length is 30 to 40 days. Stick to it! Don’t rush and put your project at risk by launching sooner than initially planned. Even though you may be tempted to do so! Building a great project is a job that sometimes requires constant adjustments: share your pre-launch link and ask for feedback frequently! You’re under no pressure to launch on any given date, so never feel obligated to do so. Just take the time you need to be thorough and get it right, then launch. Jonathan Garcia, co-founder and project manager at Backercamp. If you need help with any aspect of your project (either being in a pre-launch or live stage), the team at Backercamp is always happy to help! See our packages at www.backercamp.com, and feel free to drop us a line at hello@backercamp.com.